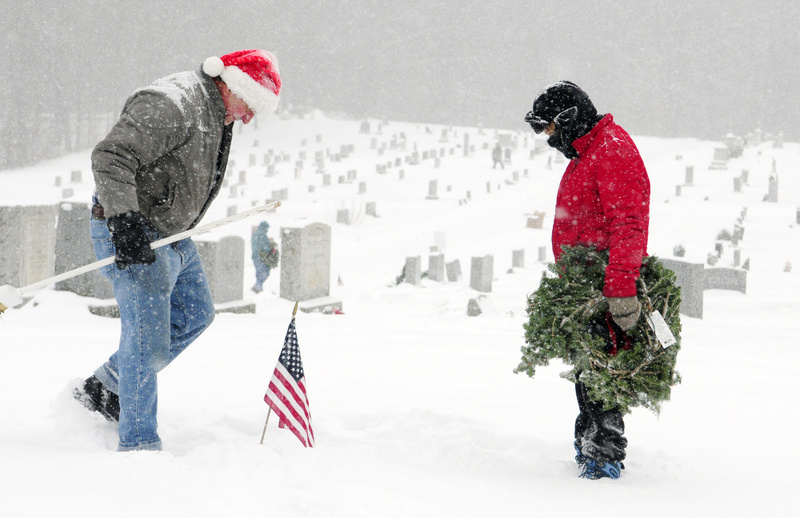 Snow and cold didn't deter those who took part in the national observance of Wreaths Across America at two local cemeteries. GARDINER — Laura Barron spoke Melvin Wadsworth’s name Saturday, and in that brief moment the memory of that soldier lived again. Barron, 13, got some help in clearing the snow from the flat marker bearing Wadsworth’s name and placed a wreath on his grave in Oak Grove Cemetery as part of a national observance of Wreaths Across America. She was among the nearly 30 people who gathered in Gardiner to honor the lives of veterans as part of Wreaths Across America, which coordinates wreath-laying ceremonies across the country and overseas with the annual ceremony held at Arlington National Cemetery in Arlington, Virginia. Wreaths Across America’s mission is to remember fallen U.S. troops, honor those who serve and teach children the value of freedom. 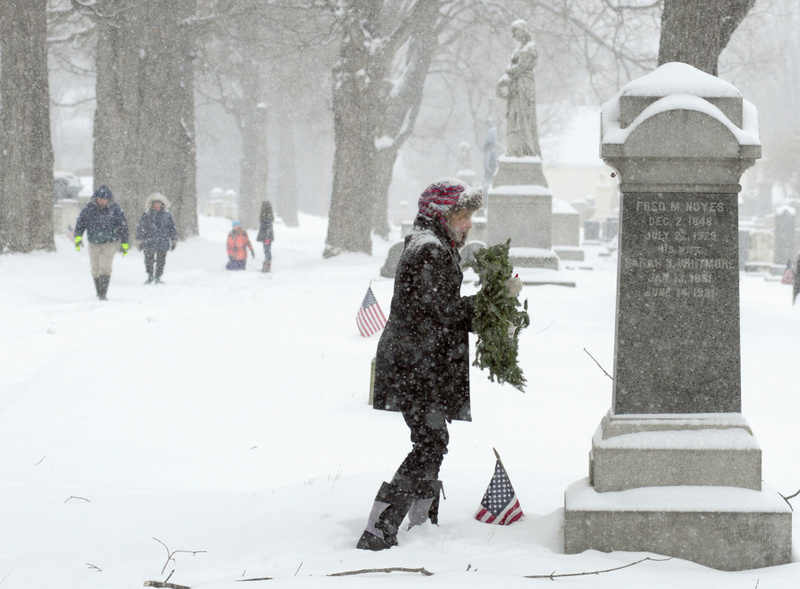 Barron’s family — parents, sisters and an aunt and an uncle — spread out across Oak Grove and St. Joseph’s cemeteries to hunt up the graves of veterans in the snow. They came as a family effort, which was led by event organizer James Keenan, himself a veteran of the Army, a member of the Smith-Wiley American Legion Post in Gardiner and Barron’s grandfather. After a brief program at 10:30 a.m., volunteers and relatives of veterans who have died trekked across the adjoining cemeteries, placing nearly 400 wreaths. Donations from people, organizations and businesses paid for 370 of the wreaths, Keenan said Saturday. The wreaths cost $15 each. Several others brought wreaths they had made as well. 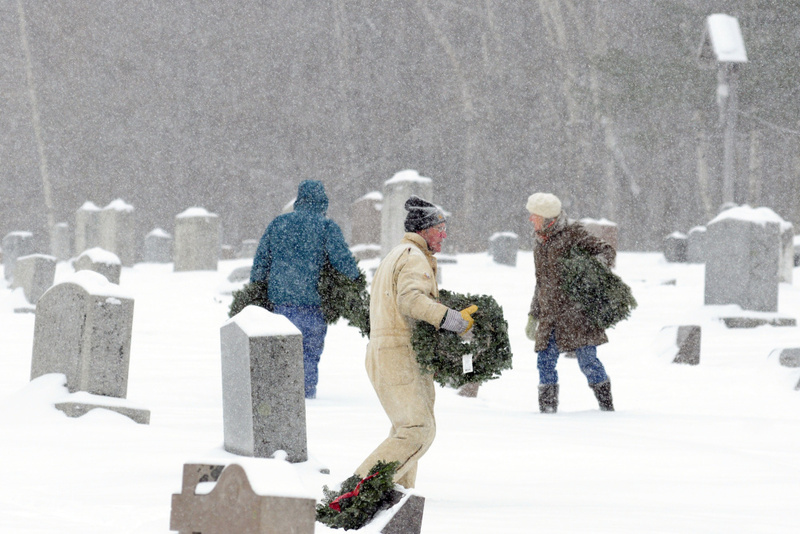 Because of the near-zero temperature and falling snow, organizers distributed boxes of wreaths across the cemeteries so the wreaths were handy to those who turned up to take part. Some of the graves were easy to spot, thanks to the American flags that remain in place marking the locations of graves. Some headstones were marked with a small, round black-and-gold sticker to distinguish them from the graves of civilians. Some flat markers had to be cleared with a broom to identify the veteran buried there. This is the 25th year of Wreaths Across America, and Keenan said as of today, organizers of the national event were hoping to lay 1 million wreaths in cemeteries both in this country and abroad. About 900,000 wreaths were laid in 2015. 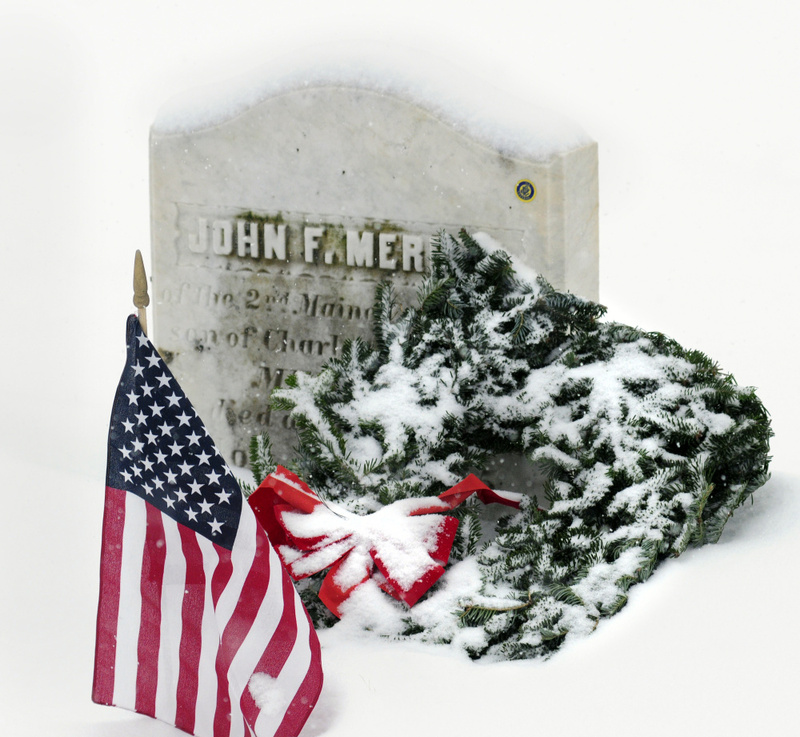 Across central Maine, ceremonies were scheduled at nearly 20 cemeteries, including Maine Veterans’ Memorial Cemetery in Augusta, Togus National Cemetery in Chelsea, the Pine Grove Cemetery in Waterville, China Village Cemetery, Lakeview Cemetery in Mount Vernon and Cummings Cemetery in Manchester. “If they could increase that number, everyone would feel good,” Keenan said. As much as he appreciates the donations, Keenan said he’d like someday to see a big enough committee in southern Kennebec County to expand the observance. While he’s not a fan of setting goals, he’d like to increase awareness and improve donations. Next year, he said, he hopes to start work earlier to secure donations. Several people missed the Nov. 28 ordering deadline. Barron said she expected to be out as long as her sister could withstand the cold, but by noon the wreaths had all been distributed and the volunteers were headed for shelter. “I was glad we were able to do it and get it over with on Saturday, because the weather isn’t going to get much better Sunday,” Keenan said. Even so, he’s got plans. 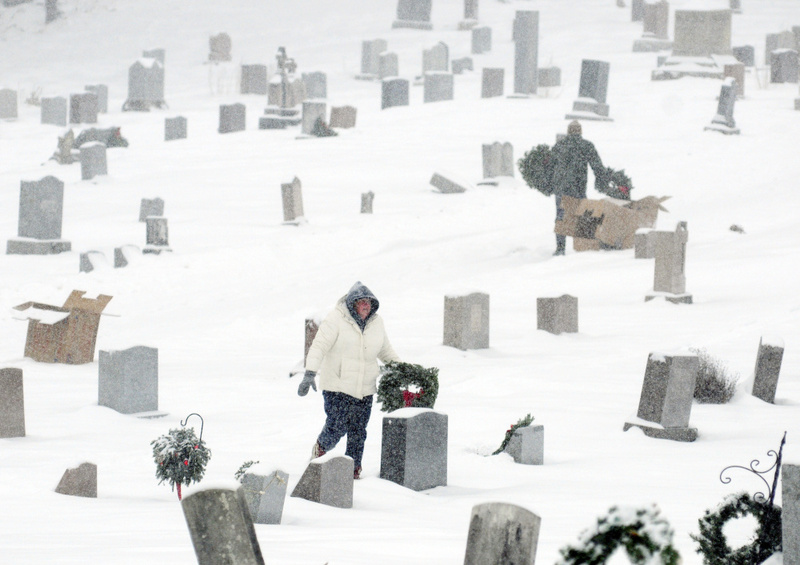 He’ll check the cemeteries to make sure no boxes were left behind, and he has a couple more wreaths to place. One will go on the grave of Benjamin Smith, one of the veterans for whom his American Legion post is named in North Street Cemetery in Farmingdale; and another will go on the cemetery’s entrance gate.